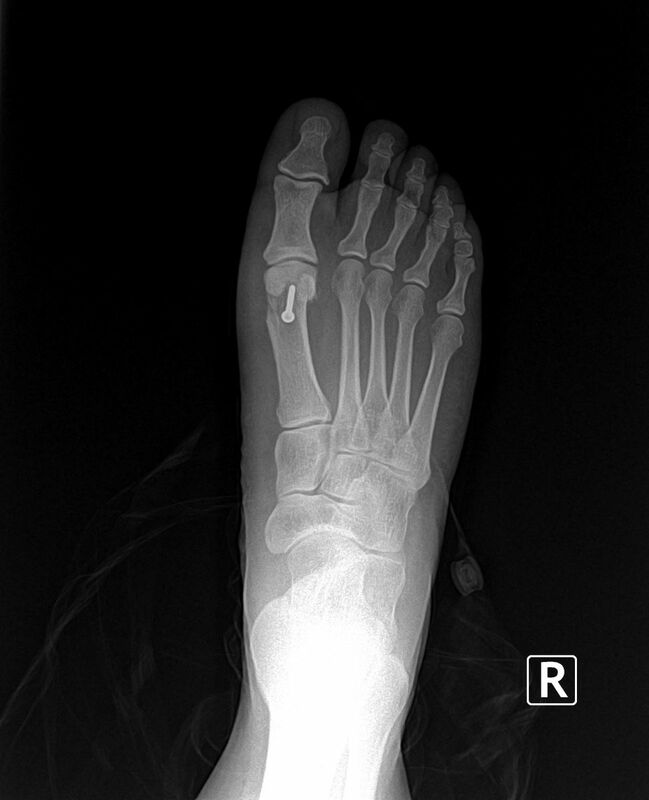 For more detailed information on Bunions, and to visit our Photo Gallery of before and after pictures and X-rays, visit www.bunionclinics.com!!! Most bunion surgeries today are performed on an outpatient basis at a surgical center or hospital. Set aside the entire day for the surgery, although you may only be at the facility for a half day. Seeing your Primary Care Physician (PCP) to make sure any other health conditions are stabilized prior to surgery and to document your complete medical history, which can then be given to the surgeon. Lining up another person to drive you home and stay with you for the first 24-48 hours after the surgery. Further clearance may be needed by a specialist (i.e Cardiac Clearance) as well. Your surgeon will let you know what is needed at the time of your surgical consultation. The surgery is performed on this day. The hospital will let you know what time they would like you to be there and how long it will take. Prior arrangements for transportation home after the surgery must be made. The patient leaves the facility walking with special surgical walking boot or splint (to be used at all times). It will be provided for the patient at the pre operative visit in the doctor’s office prior to surgery. A presciption for crutches or a walker will be given if needed. There is no cast on the foot, only a soft gauze dressing. The dressing must stay dry and should not be changed until the first post-op office visit. The application of a ice machine or ice packs to the foot is important. If using ice machine the hospital will fill the machine the first time and you will add ice as needed. The pad will remain on your foot and you will turn on for 1 hour and off for 1 hour except for night time where you will fill the cooler halfway full, turn on low setting, and leave on for the night. If using ice packs be careful to make sure the foot does not get wet. Apply a towel around the ice pack to absorb any condensation from the ice. New ice packs should be applied about four times each day, for the first 3 or 4 days. The patient may ambulate for short distances within the home or to a car during this period, using the surgical walking boot. It is equally important during this time to keep the foot elevated to the level of the waist. Those patients that elevate their foot and apply the ice packs report minimal post-operative pain, experience the least amount of swelling and require the least amount of pain medication. Ice and elevation is VERY important. The reduction of foot swelling during this period will have a significant effect on the entire recovery process. The #1 complaint after foot surgery is swelling. The patient comes to the office. The sutures (stitches) are NOT removed at this visit. Only the bandages are changed and an unna boot is applied (soft cast) for edema control. Pain Pump will be removed. The patient continues to wear the same walking boot, with limited ambulation. Some patients are recommended to be non-weight bearing the doctor will let you know. It is extremely important to limit ambulation (standing, walking) during the first two weeks, as it will cause increased foot swelling and a delay in healing. The patient comes to the office, where the dressings are removed and based on the rate of healing the sutures maybe removed. Removal of the sutures is only minimally uncomfortable. Post-operative x-rays may be taken. An Unna boot (soft cast) will be applied. The patient may remove that dressing in 24-48 hours. They may then begin getting the foot wet as usual. Do NOT soak the foot in any hot tubs, bathtubs, swimming pools, lakes, rivers, etc. The doctor may also recommend a special compression sock (to help with swelling), and/or a toe alignment splint. If sutures are removed a prescription scar cream or scar cream recommendation will be given (to improve the scar appearance and reduce painful or raised scars). You will continue the use of the ice machine or icing (to help with swelling and any discomfort). A TENS unit (for inflammation and pain)may be dispensed or used by Physical Therapy. Range of motion exercise as well as physical therapy is typically begun at this visit; (it is very important to regain joint motion/mobility and break up scar tissue). Continue to limit your activities. You will be seen in the office to evaluate your healing and ambulation. Depending on the type of procedure and current healing the doctor may allow you to transition into sneaker or hard/thick soled shoe (no barefoot or flip flops). The comfort levels will vary. Do not push yourself. A larger than normal shoe may be needed due to moderate foot swelling which is normal at this time. You may be able to return to regular shoes. Custom molded orthotics maybe recommended at this time. Most low-impact exercises are performed to about 80% of their usual level. You may return to your normal activity level. NOTE: THE ABOVE GUIDELINES MAY VARY FROM PATIENT TO PATIENT. INDIVIDUAL PATIENTS WILL VARY IN THEIR EXPERIENCES. WAIT FOR THE DOCTOR TO APPROVE EACH OF THE CHANGES ON THIS LIST.